A multidisciplinary team of researchers, including forensic anthropologists, archaeologists, and historians, announced this week that they believe they have found the skeletal remains of Miguel de Cervantes and his wife, Catalina de Salazar. Born in Alcala de Henares, Spain on September 29, 1547, Cervantes wrote ‘The Ingenious Gentleman Don Quixote of La Mancha,’ which has sold more that 500 million copies and is considered by many to be the precursor of the modern novel. Cervantes died from cirrhosis of the liver on April 22, 1616 and was buried the day after at the church of the Convent of the Barefoot Trinitarian, located in Madrid’s literary quarter. However, the remains of Cervantes and his wife had been moved in 1673, when the church underwent reconstruction, so their exact location was not known. The team, led by forensic anthropologist Francisco Etxeberria, started the search for Cervantes’ tomb in April of 2014. They used infrared cameras, 3D scanners, and ground-penetrating radar to locate the areas in the convent and the crypts where Cervantes’ remains might be interred. The team faced months of negotiations with Madrid City Hall and church authorities to get the necessary permits for the excavation, which finally began in January 2015. Etxeberria was referring to the wounds Cervantes received during the Battle of Lepanto in 1571, a conflict fought between the Spanish navy and the Ottoman fleet, which Spain ultimately won. During this battle, Cervantes was wounded by three musket shots, two in the chest and one in his left hand. On January 30th the team announced that they believe they located Cervantes coffin in the alcove of a crypt. The team was confident of their discovery because the writer’s initials, ‘MC,’ were inscribed on the side of the old wooden coffin in “metal tacks.” (pictured here). According to La Prensa, scientists used mass spectrometry to analyze the “bone composition” and to estimate the age of the remains. The results suggest the remains belong to the celebrated Spanish author and his wife. Despite the fact that the skeletons are are not complete and what bones are present are in “poor condition,” the date of the bones correspond with the deaths of Cervantes and Salazar. During excavations of the crypt, archaeologists also found 200 bodies (mostly belonging to children) and mummified remains. 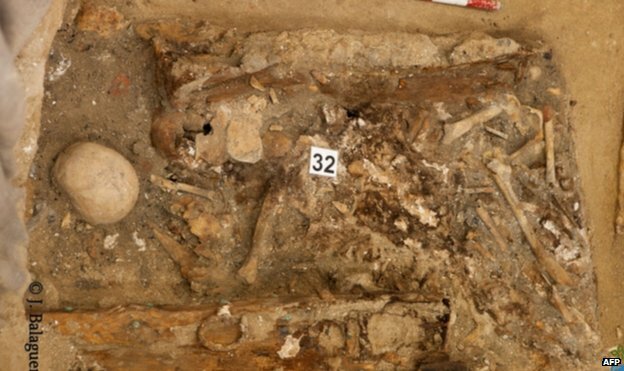 These bodies are expected to shed light on the life of the people of Madrid in the 16th and 17th centuries. The investigation coincides with the 400th of the author’s death (in 2016) and the publication of the second part of Don Quixote. Thank you to @DrKillgrove, where the link to the announcement was first seen.